Together with Marseille taking the throne from Maribor in 2013 as the European Capital of Culture, exactly on the twentieth anniversary of Slovak independence, Košice has made a great impression on me. There was also constantly in my mind the link between the city and the first name of pop-art, artist Andy Warhol, who was born in a village not far from Košice. A large retrospective of his work was one of the central events in the scope of the European Capital of Culture project and back then they set out the objective of converting the city into “a centre of creativity and a new future for young, creative people”. Košice was mainly an industrial city, which is why the organisers set the goal of changing the image of the city and more specifically to change its content. To give it more artistic and cultural character they renovated the old town of Košice and also fully adapted some of the buildings for cultural purposes. During the European Capital of Culture presidency more than two hundred events took place and the positive spirit of these events can be felt at every step; the makeover of the city was very well managed. The history of Košice is complex and to understand the city we highly recommend a visit with locals who can reveal its many different layers, from the traces of the Hungarian elite that contributed to the city’s prosperity in the 19th century to the time in 1919 when Slovakia joined the Czech Republic and the residents enjoyed a short-term boom. At the time when Czech-Slovakia was a Soviet satellite, Košice went through intense industrialisation that resulted in its gray satellite settlements. Luckily, the medieval part of the city was left intact. Košice’s residents have changed country four time in the last century, which is another reason the buildings and sights are imbued with the history and stories the city has written. Almost every building has its own story and most of them are testament to the historical richness of the people who have traded on the troubled Slovak borders for centuries. The best way to get a complete view of the city is from the north tower of the St. Elizabeth cathedral. When you walk up its 161 spiral stairs, a view to the main street (Hlavna Street) and the singing fountain opens up. The cathedral was built in 1380 and is considered the most eastern Gothic cathedral in Europe, symbolically separating the East and West, the Catholic and Orthodox Churches. Andrej Varchola – better known as Andy Warhol, originates from the city of Medzilaborce near Košice. His father, Andrej Varchola, moved to Pittsburgh in 1913. You can visit the Andy Warhol Museum of Modern Art in the city, which has the second biggest collection of his pop-art works in the world (160). The former barracks that became Kulturpark; a former Art Nouveau pool that has become the Kunsthalle and Vymennik, a heating station that has become a cultural centre… all of these are just a part of the creative and cultural infrastructure of the city that has been formed in 2013. The buildings are exhibiting, in a symbolic way, the connection between the past and the future of the town, which has now also acquired top class event and conference rooms. 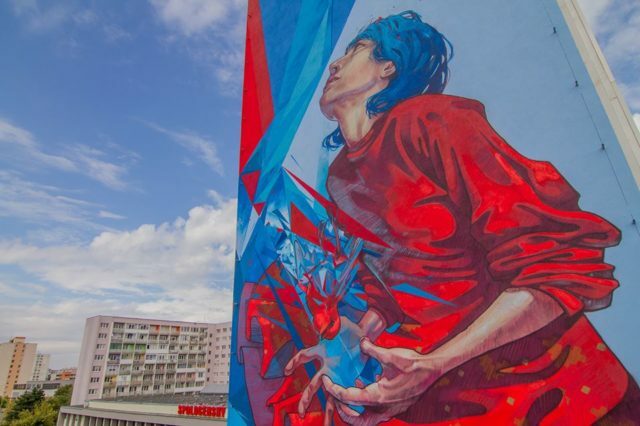 The city became attractive also because of projects like Open City Gallery, conceived by artist Viktor Fehér, embellising 26 façades of modernistic residential buildings with giant art graffiti. When the city roads and highways give way to more interesting by-ways, Eastern Slovakia reveals its authentic face. Many of its cities, castles and natural attractions are on the UNESCO World Heritage List, beginning with the Slovak (Slovenský) Karst landscape, Karst caves full of stalactite adornments and for which we recommend visiting the Domica cave as a starting point. One of the most picturesque medieval towns is Levoča, north of which is the invitingly hilly landscape of the Pieniny and Dunajec River, a very popular spot for rafting. Besides the actual substance, the project has also changed the creative scene of the city, and Tomáš Ďžadoň is part of the new artistic scene. On the roof of a suburban residential tower he has placed three wooden farm buildings that the locals call ‘Drevenice’. It connected the historical memory of the older generations with Košice’s modern reality. There is also the controversial installation »Hradova Hill« (Castle Hill) that has generated a wave of media coverage, but fortunately they have been able to find a solution at the location that is easily visible from the different sides of the city. In recent years there has also been a shift from the traditional combination of potatoes and meat to more demanding cuisine. The easiest way to feel the multi-culturalism of Košice is during the annual Košice Gourmet Festival, which takes place in June. The open kitchen style event attracts 10,000 visitors who can learn about the rich culinary tradition of the region. The culinary revolution is based on authentic recipes, genuine ingredients and fine wines and where you can best experience the true spirit of the culinary scene in fusion is in deli, shop and restaurant ‘Dva Dve’, which boasts the best collection of Slovak wines, craft beers and selected gourmet products. We recommend a visit to Hostinec, the oldest pub in town, where they’ll show you the art of craft beer production. Ice-hockey is by far Slovakia’s most popular sport, despite the substantial success of domestic football players. When the sticks get crossed with eternal neighbourly rivals the Czechs, the cities’ streets die, as the vast majority of people are glued to the television. Sport is also very high in the list of Slovak values, which is also why Košice became European City of Sports in 2016, a title that allowed them to host numerous sports events and to strongly improve their sports infrastructure. Košice has everything, from boutique special venues to a giant amphitheatre that was built in 1954 and can accommodate up to 12,000 visitors. The East Slovak Museum has a precious collection of Košice Gold Treasure with 2,910 gold coins from all around the world that were found during the renovation of the city in 1935. Besides the beautiful neo-renaissance entrance hall the museum also offers a modern hall that can accommodate up to 100 guests. A few more historical buildings along the main street can be used as a venue for your next event, including the Historic Town Hall and State Theatre, which is located right next to the square with the famous singing fountain. The park can also be an interesting venue for summer evening events, if the famous “Košice wind” or “VKV”, as locals like to call it, won’t blow in to disturb you. This is a special venue deserving of a separate mention. Attention was drawn to it with a concert of cult Slovenian band ‘Laibach’, performing there on April 14, 2016 with songs from their new album, ‘Spectre’. Managed by the non-profit association KulturFabrik the multifunctional centre can be a unique platform through which you can spice up your event with a dose of diversity and mix it with the urban creative scene. Tabačka began to operate in 2012 and it was renovated and newly opened in 2015. All conference hotels and venues are in the city centre and virtually all within walking distance. Even with accommodating congress guests there will not be any major issues and any venue you choose can be reached on foot, which is considered a high priority. Hotel Yasmin is one of the most popular congress hotels in the city. Completely renovated in 2009, today it offers designer rooms and a very pleasant congress centre with daylight. We were particularly impressed by a spacious garden, suitable for receptions during the warmer months. The only hotel in town that is part of an international chain is the Doubletree by Hilton at the edge of the old city centre. The hotel boasts 170 rooms in addition to the largest conference hall in the town for 400 people. Hotel Centrum is connected to the technical university and offers a 2,200m2 multifunctional space for exhibitions and conferences, as well as a series of smaller halls. If you prefer the cultural offer of the city, then one of the halls in the Kulturpark would be an excellent choice. It is hard to find a more technically equipped hall in the entire destination. The Visit Kosice Tourist office is particularly enthusiastic and truly cares of the personal relationship; they are trying to meet the needs of international congress organisers every step of the way. Expect the unexpected. A unique festival of street art that brings non-traditional forms of arts to the city streets. The event that brings more than 40 winemakers from all over Slovakia and its neighbouring countries to Slovakia. International festival that invites everyone for a night walk through the city filled with new experiences and spectacles. Only once a year does night in Košice turn into day and the streets fill with people and art. This east Slovakian town is today a picturesque mix of Renaissance, Baroque, Rococo and Art Nouveau, the variety of architecture witness to the fact that it was a wealthy city at the crossroads of many trade routes. The medieval centre of the main street is a particularly strong experience and attracts with its colourfulness, tidiness and youthful energy. A controversial renovation of the city centre, which was led by Mayor Rudolf Schuster (later President of the Slovak Republic) in the nineties, has created a strong experiential core that is the basis of the city’s current rapid tourism development. Kosice is the second largest city in Slovakia (234,000 inhabitants) that has set as its objective the urban transformation from an industrial to an openly creative city. This has been very successful, as the municipal infrastructure, public transport and orderliness of the city are at high level, as is the security, with the biggest drawback the slightly limited flight availability, but that is also improving with the introduction of several new flight connections (Turkish Airlines). The city looks modern, tidy and is especially friendly to convention guests. For the locals it’s a nice place to live in too. The core of the city’s hotel offer is covered by smaller, independent boutique hotels and two first rate hotels, Yasmin Hotel and the DoubleTree by Hilton (together they have 366 rooms). Most of the tourists coming to the city are from neighbouring countries: the Czech Republic, Poland, Hungary and Germany. The city has a highly developed hospitality and culinary offer, which is particularly attractive in the summer. Košice is also an ideal location for discovering the surrounding tourist attractions. The tourist facilities and current airport capacity (up to 800,000 passengers per year) are placing Kosice in the bracket for medium-sized conferences of up to 500 participants. The Košice meetings industry is driven by a strong University, the ICT Cluster and a comprehensive corporate sector. This in itself generates a relatively large congress need. Major projects, such as the ECC, consolidated a network of partners accustomed to large-scale projects. Conference facilities is at the European level, as well as a developed DMC and other support agencies. For a total congress breakthrough Košice should fully develop all the activities of a Convention Bureau, which could link the dispersed and numerous offer of congress ambassadors of the city. Known as the ‘Steel City’, Kosice, is a major industrial centre of Slovakia and the second university centre of Slovakia. The Technical University of Kosice is attended by 15,000 students, while the University of Pavol Jozef Šafárik has 7,500. The University of Veterinary Medicine is among the best in the world. The convention industry is at the crossroads of art, business, science, culture and the creative industries. The full potential of the city is calling for a more integrated cross-sectoral approach. We believe that this role can be successfully carried out also through congress activities with a Convention Bureau, which should in first phase improve the image of the destination and use its advantages and key benefits, which includes security, political stability and competitiveness in light of the quality to price relationship. Košice is internationally known primarily as a city of culture, and the successful European Capital of Culture project heavily contributed to that. The city is less known on the international conference map, despite the obvious advantages it presents. So the city still has a lot of work to do in the field of branding and all forms of modern communication, including content marketing and digital presentation of its congress potential. A new, in-depth and easily accessible website can already improve the situation. In this area, the destination has a lot of work and opportunities ahead. Funky Street Tour – Take a funky retro tour through the off-the-beaten-track places of the communist past, as well as the recent transformations in Košice, in the legendary 1970s Czechoslovak car Škoda 120. Visit vast concrete housing estate areas, neighbourhoods of rich and poor, a Cold War shelter, an abandoned magnesite factory and railway tunnel, local pub, former barracks and a swimming pool transformed into a cultural venue. If Bratislava is the capital of the country, then Kosice can be declared its creative centre, one that impresses with vibrant urban zones, positive diversity and an urban transformation of the city throughout layers of history. Košice seems pleasant for the accommodation and organisation of congresses and also seems a very tolerant city. A border location has greatly contributed to that, which has made residents more tolerant, but it is precisely this border diversity that defines the vitality and resistance of the city. The specific local identity gives the city its charm and soul, and it ranks it among one of the most promising Eastern European convention destinations. In a special way the Kosice spirit embodies the Hungarian writer Sandor Marai, who was born in 1900 into a noble family in what was then the Austro-Hungarian Empire. In his novels he felt an echo of the past and history of a multi-ethnic and multi-cultural city, but also the melancholy of the Pannonian plains, which you will detect in the streets and squares of Kosice. In this city the congress experience will certainly be unforgettable, just as his novels are memorable. If Sandor Marai was a forgotten author until the mid-nineties, today tourists come to this city because of him – it seems that a similar congress renaissance is happening in Košice, which until recently was an overlooked congress destination.